April is National Child Abuse Prevention Month. The Villages and Prevent Child Abuse Indiana (PCAI), a Division of The Villages, recognizes this important month with events and opportunities in the community to raise funds and awareness to support child abuse prevention and education in Indiana. The pinwheel is a national symbol and uplifting reminder of childhood and the bright futures all children deserve. 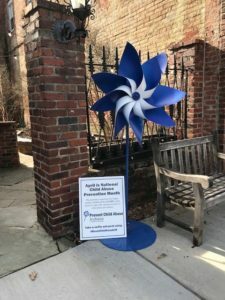 A few years ago, The Villages and PCAI created life-size, blue pinwheels to be shared throughout central Indiana as a symbol of every child’ right to a safe, happy, and carefree childhood. 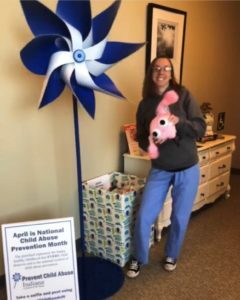 This year, seven partners have committed to showing their support by hosting a pinwheel throughout the month of April. Learn more about our partners below and where you can find these life-size pinwheels. Don’t forget to snap a “selfie” and post using #GreatChildhoodsIN. Westport Homes is a quality new home builder in Indianapolis, Indiana, offering new-build homes & move-in ready homes. Their people and processes, durability and assurance of quality new home building have expanded their growth from Indianapolis to operations in Ft. Wayne and Columbus, Ohio. Westport Homes’ ownership, leadership and team have been longtime supporters, board members, donors, and volunteers of The Villages and Prevent Child Abuse Indiana for over 10 years. Well Done Marketing says “Practically speaking, we’re a group of writers, designers, account executives, tech workers, analysts, and strategists. Philosophically speaking, the answer is a little more complicated.” Well Done works with clients who want to be great, and who want to make the world a better place. Well Done has recently helped The Villages design a new website and has become a great partner for the deserving children and families we serve. Sacred Roots provides exceptional nurse-midwifery care supporting women and their families towards optimal health and empowered birth in central Indiana’s only free-standing birth center. They are a central hub for women and their families to access pregnancy, childbirth, parenting, and holistic women’s health care education, support and services. This is Sacred Roots second time hosting a life-size pinwheel and spreading awareness about the importance of child abuse prevention. Mini Minds works to empower families to raise children who thrive. Through a multitude of services, they work with parents and children to actively recognize challenges, seek solutions, welcome changes and grow closer. 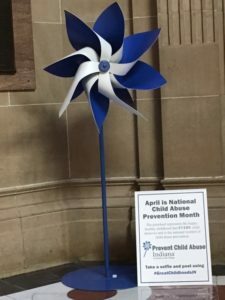 This is Mini Minds second time hosting a life-size pinwheel and spreading awareness about the importance of child abuse prevention. KSM Consulting is a management, technology, cyber security, and data consulting firm. Whether it’s crafting innovative data solutions, helping to keep your organization secure, turning a business around financially, or streamlining IT processes, they are known for finding smart solutions to complex problems. KSM Consulting has been a great partner of The Villages and PCAIN and those we serve. The Indiana Statehouse houses the seats of Government for the State of Indiana. This historical building, completed in 1888, is home to all executive offices, the Indiana State Senate, the Indiana House of Representatives, and the Indiana State Supreme Court, among others. The four-floors of the Statehouse also contain both the House and Senate Chambers. Opened in 2000 as Cobblestone Grill, a 2017 renovation included updating their name to Cobblestone. They offer guests a relaxed and contemporary dining experience and an innovative American cuisine, featuring the freshest farm to table, locally sourced seasonal ingredients available. Cobblestone invites you to visit for lunch, dinner or Saturday and Sunday brunch. Thanks to Cobblestone for being our first partner in Zionsville. Learn more here about Prevent Child Abuse Indiana and the important work they do all year long. 92% of every dollar goes directly to our kids.